At Spreetail, we challenge ourselves to reach big goals, to think bigger and bolder about what’s possible for our business and for our team. The goals we set each year align with our mission: to make a dent in the universe by delighting millions of customers, creating opportunity and wealth for our team, while revolutionizing the communities we touch. Now, as we look ahead to 2019, we’re also taking a look back at what we’ve accomplished together over the past 12 months. Here are just a few of our favorite moments from 2018! We opened new fulfillment centers in Georgia and Texas, reducing shipping times for our customers. Our Customer Experience team answered 90% of customer emails within one hour and maintained a 17-second average call hold time. We introduced 24-hour call coverage to better serve our customers around the clock. Our team doubled in size, as we welcomed more than 325 new Spreetailers! Our largest intern class of 67 joined us for the summer — and 64% of them will continue with us in another internship or full-time opportunity after graduation. We expanded our office space in Lincoln and announced new office locations in Omaha and Austin, plus a photo studio in Dallas. Spreetail was named one of the Best Places to Work in 2019 by Glassdoor. We launched the first-ever Elevate community art project in Lincoln. We worked with community partners to launch Lincoln’s BikeLNK bike share program. We announced a partnership with Empowerment Plan to give out 2,000 EMPWR Coats to chronically homeless individuals in 20 cities across the United States. Spreetail received the Cornerstone Award, the Lincoln Chamber of Commerce’s top annual business award. The Lincoln Chamber of Commerce honors a large employer that contributes significantly to the local economy with the Cornerstone Award each year. Spreetail received this honor in 2018. We’re so proud of the Spreetailers who helped us accomplish amazing things this past year. Each day, our team shows up to contribute to our ambitious goals. As a result, we focus on fostering a workplace where every Spreetailer can pursue their passions and fulfill their purpose, and empower others to do the same. As we set new goals for 2019, we’ll continue to focus on our purpose-driven mission. We’ll continue to push the limit and chase what some would consider to be a pipe dream, and we’ll tackle some of our industry’s biggest challenges as a result. Never miss a beat! Follow us on Facebook, LinkedIn, Instagram, and Twitter to see what’s next. 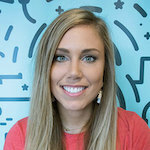 Samantha Gerken is a Training & Development Specialist at Spreetail.